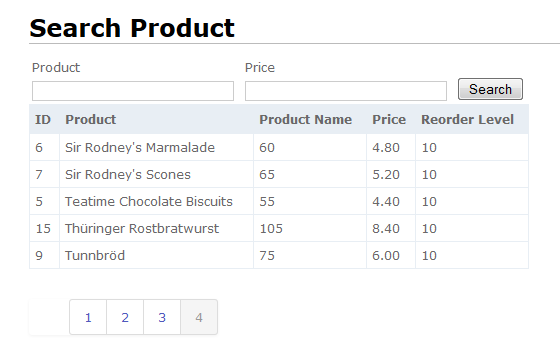 MVC Searh page with pagination: It’s very easy to create a search page in asp.net but when I try to create the same in MVC I faced many problems, how to create model, how to keep searched values in search controls, pagination, I found myself nowhere, so start searching for some good examples but whatever I found was not quite helpful so try my own. I will explain the same in this article. As you can see we added two name spaces PagedList and DataAnnotations. If you have not installed PagedList with your visual studio then Install it from NuGet PagedList according to your MVC version. You can change Records Per Page value, I used 5 so I can see the paging at the bottom. I used entity framework which is not needed to discuss, I hope you are expert in it, otherwise this article will be quire long.